Parking was a mother at this location--it was worth it for this beautiful bargain of a burger. The place was a dump, but I went to Hinano for a burger...a burger that happened to have been served at a beach dive bar. 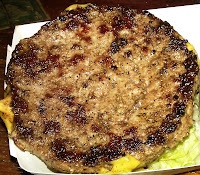 The burgers were cheap and excellent--thin, pressed hard, and liberally seasoned with salt, pepper, and some extra spices. They were cooked on a hot griddle, so the sear was lovely, dark, and deep. 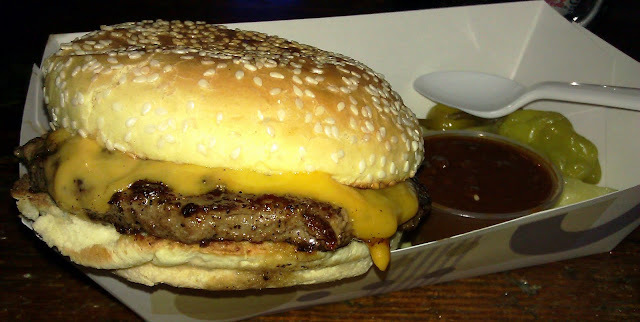 The cheese--Cheddar just mild enough not to compete with the seasoning, but gooey enough to perfectly complement the crisp sear on the juicy patty. The bun was yeasty, seeded, and toasted top and bottom. No fries--a bag of chips, but let's face it, you don't need the fries or the chips. Deal with it, lard-monkey. The drinks come in mugs out of the freezer...nice touch. 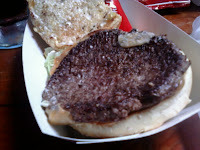 Hinano hit the spot when it came to a simple, honest cheeseburger--no flair, no zazz---just an straight-forward burger. Burger Review : A solid YES on the scale of Yes to No. Revisited on 30MAY11--not as awesome--average sear--6 bucks for a 5 ounce disk of pre-frozen, pre-formed Chuck from Sysco Foods. The smaller beef patty was only mildly beefy, and it was cooked to near dryness. The value that was once strong has ceased to be. It seemed that fame caught up with Hinano.